It’s little more than nine hours until you get to bid a speedy ta-ra to your bulging inbox and to keep you entertained in the interim, we’ve been digging deep to discover the top picks of just about everything at Brum’s hottest new opening, the Botanist, courtesy of its General Manager, Julian Rose-Gibbs. And from what we’ve heard, we may have just found a new home. Unless, of course, you’ll have us? Thought not. “Before dinner, after dinner, or – you know – during dinner” Julian is yet to come across a person who hasn’t gone doe-eyed at his first choice cocktail, the Apricot and Mint Daiquiri (£6.95). Herbaceous and fragrant fruity combinations are the order of the day across the new bar and restaurant’s extensive cocktail list. But off list is also actively encouraged. Go off list. Double dog dare you. With 95 bottled beers to pick between, getting Julian to select his numero uno was no mean feat, but he eventually committed to the Alhambra Reserva for its “great taste and good looks”. The Botanist has seriously upped its ale and craft beer offering across its northern outposts over the past few years and is putting on ale masterclasses for groups of six or more at its Temple Street nexus. The GM recommends the Botanist’s deli platters. For £9.95, select four plates from a list of over twenty, which includes a stalwart bevy of veggie options. He’s particularly keen on the pomegranate and minted pearl couscous. We’re going to completely ignore him though, and recommend the chicken liver and rum pâté with plum and apple chutney, pictured (£5.95). Mainly because it includes rum pâté. Chicken on a stick. You could stop there and we’d be sold. But for the more refined, we should probably mention that these handsome beauties come soaked in sweet chilli, ginger and garlic butter and also as prawn, halloumi or lamb dishes. From £10.95, the Hanging Kebabs (they’ve genuinely trademarked that name) are served with “properly seasoned chips” but you’ll have to bring your own worthy looking books for the full effect. Julian’s also lauded praise on their soon-to-be served Malaysian chicken curry. The GM made easy work of recommending the Botanist’s old school puds (all priced at £4.95). Having steered clear of the likes of trifle and peach melba for some thirty years, Julian, who professes to not really being a dessert man, polished off the lot when taste-testing the Botanist’s afters offering. And if you’re not completely kebabbed-out by this stage, there’s one of the strawberry and marshmallow persuasion. And it looks like this. You’re welcome. We’d like to think we’re pretty good to you. In fact, we’re just going to go ahead and say it: we are. 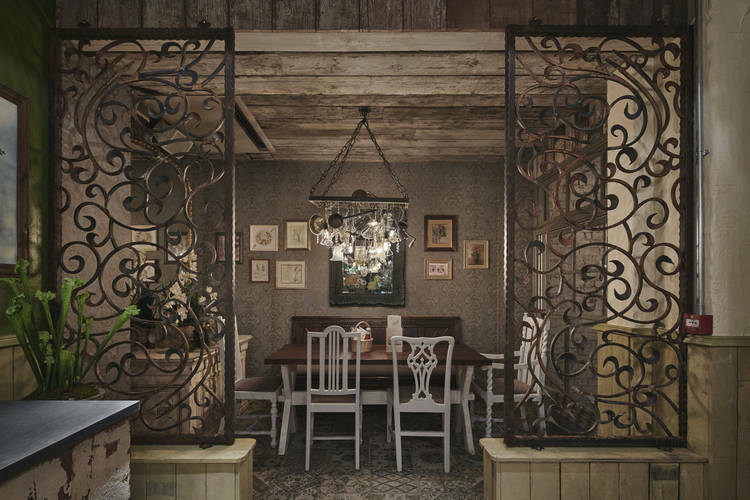 So good in fact that while the Botanist doesn’t technically open its ornate gates until Monday (April 6), you can preview it this Saturday or Sunday and get 40% off your total food bill, here. There’s also 25% off food throughout April for all online bookings. Act quickly, or not.